Casio makes a lot of keyboards. That's the company's primary contribution to music, and while it's a pretty big one, it's also looking to adapt to, well, what the youth have been listening to (and making) in recent years. To that end, it's launching two different devices better suited to dance music, hip-hop, electronica and more. There's the XW-DJ1, with a 7-inch scratch disc, and the XW-PD1, which combines a 16-pad sampler with a synthesizer, sequencer and effector. Both run off batteries, have built-in speakers and connect to your iPhone/iPad, PC or Mac through a proprietary cable. The idea is that it should be all you need to "DJ" for a party, though we'd advise adding some speakers to the arrangement. The XW-DJ1 DJ Controller will launch this month, priced at $299, while the XW-PD1 Groove Center (we'd probably drop the "Groove" there), will be available in early March for a pricier $399. Those looking to upgrade their next party playlist might want to read into the details, which are right after the break. Playing with a prototype ahead of the announce, we'll say one thing: The learning curve is a little steep. 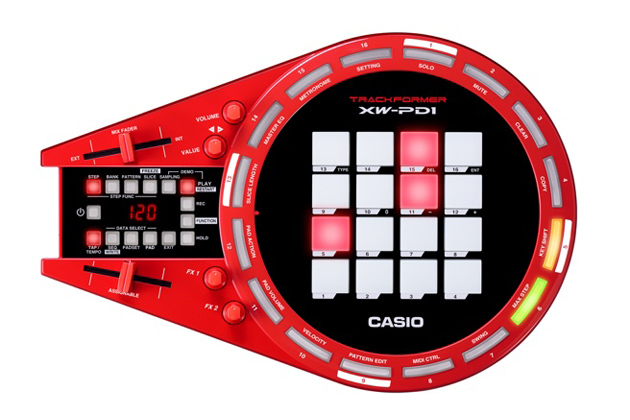 Casio's reps reiterated that both devices are positioned below pro DJ gear, but the surfeit of buttons around the entire deck, not to mention the programmable loop buttons, meant this editor didn't even know where to begin. When we got to play with the XW-DJ1 (that's the black one with the turntable), the deck immediately turns into a very enjoyable timesink. The Trackformer ties into Algoriddim's djay2 app, with the ability to fade between two music tracks, cue them up and more. There's also a cross fader on the devices themselves. The decks are powered by four AA batteries, the point being that you can maintain your playlist... if you pack enough AA batteries. The devices can also be powered through USB from a PC -- so there's another option there. The scratch pad is comfortably large -- bigger than the typical 5-inch (CD-sized) pads found on smaller mixing decks, and the textured surface means that there's something for fingers to grip. The pad has a little bit of resistance, but it's not motorized. The second DJ device swaps out the scratch pad for a 16-button pad. It's arguably the more creative of the two, offering the ability for musical dilettantes to digitally pen their own tracks, forming bass lines, percussion and melody from a Casio keyboard-esque bank of 100 preset sounds for each "step." Users can add up to 36 of their own user samples from music tracks, mic sources and, well, anywhere. DSP effects like roll, filter, bit crusher, break and pitch shift are all included, while there's a built-in synthesizer to further mutate and tinker with sounds. The XW-PD1 can even double as a MIDI controller when connected to your PC. We (well, more musical editors) will be experimenting with the new controllers here at CES very soon. Stay tuned.